Throughout history people have built bridges. The early bridges were tree trunks laid across the banks of streams. Stone slabs were then used and eventually wooden frames and finally steel. 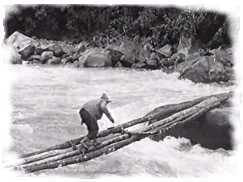 A simple solution to crossing a small stream, still used today, is to lay a wooden beam across it. A timber bridge can be made anywhere and then transported to the river or stream where it is put together. Wood frames are stronger than the simple beam bridge and weigh less. In the early days of bridges they were made from wood grown locally. Today these types of bridges are still popular but are factory made. This means that they are made in a factory away from the stream and forest and then disassembled (taken apart). The pieces are then transported to the gap or stream where the frame bridge is put together again. If the wood frame bridge spans a wide gap, it may be necessary to use a lifting device such as a crane to lift the bridge into position. The animation below shows a typical wood frame bridge. The pieces are positioned together to form triangular shapes. The triangle is a very strong shape and this means that it can support a heavy weight. The term 'triangulation' is used to describe the use of triangles, arranged together to form a frame. 2. Have you seen a modern beam bridge? 3. Draw a wood frame bridge and explain why triangular shapes are used.